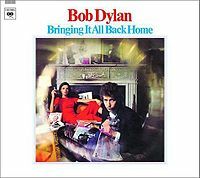 Bringing It All Back Home begins with Dylan spitting out lyrics at breakneck speed in his classic nasal screech; and blimey it’s good. Subterranean Homesick Blues is an absolute masterpiece, and insists that whilst listening, you tap rhythm your knees, grin like a fool, and get 80% of the lyrics wrong as you try to sing along. Dylan was a big name in music when this album was recorded, and yet there seems to be little production perfectionism here, with vocal clips and pops commonplace throughout. This may seem like a negative, and would certainly be frowned upon today, but the beauty of the recordings come from their simplicity, and how they sound like Dylan has just turned up in the studio, stood in front of a microphone and belted the songs out; warts and all. To risk sounding clichéd here, the album sounds timeless. A number of records from the same era can easily be dismissed as period pieces, but Bringing It All Back Home, with its lack of finesse and ’60s sound’, can’t be pigeonholed into a particular era. It has a live feel to it; not a ‘concert’ live feel, but one that makes you feel as though you’re sitting behind the recording desk, listening as it’s being performed. Praise be for producer Tom Wilson, then, for 45 years on, this still sounds amazing. Lyrically, Dylan hits real highs on this album. In fact, I’d say that his ‘skipping reels of ryhme’ on Mr Tambourine Man are amongst the best he’s ever written; therefore amongst the best anyone has ever written. After listening to this track, I felt compelled to print out the lyrics, pick up my acoustic guitar and belt it out for myself. It was only when playing it that the brilliance of the words really became apparent. They weave into the melody, complexly changing their rhythms and rhyme formations almost line by line, yet Dylan makes it sound effortless when he sings it. On the downside, Dylan doesn’t push himself too far melodically on a number of the tracks, and this does lead to some Muzak stodginess. Even on these occasions, however, the lyrics still resonate, and prevent any songs from being complete ‘duds’, even when they continue for 2 or 3 minutes after most of the enjoyment has been sucked out of them.